No matter how diligent you are about cleaning until you learn how to stop household clutter your home will still look messy even when it’s not. 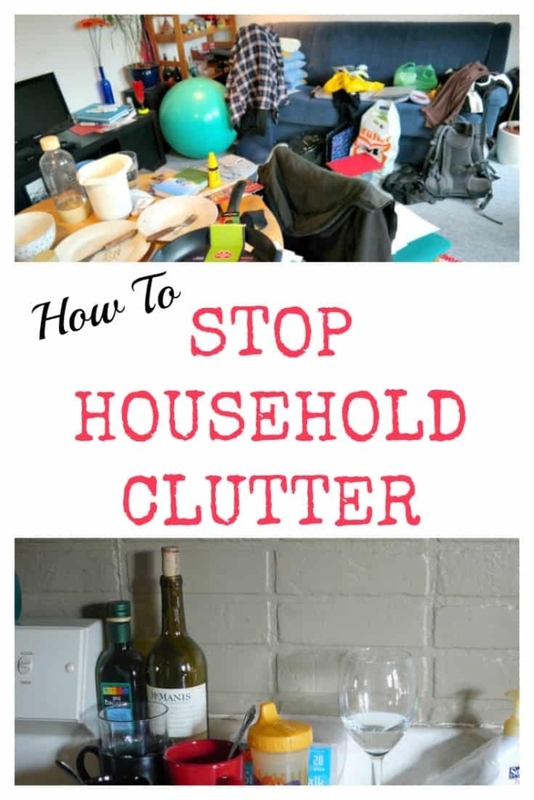 So how do you stop household clutter? First, you need to understand what clutter is, then make a plan to address it and take steps to follow your plan every day. Simply put, household clutter is anything sitting where you don’t want it to remain permanently. The laundry on your stairs. The hair clip in your underwear drawer. The bowl from the popcorn you ate in front of the TV last night. You probably have places where you’d rather all these things go. In the case of the things just mentioned, that would be the dresser, bathroom drawer, and the dishwasher, respectively. From there, it’s pretty apparent that if you want to cut or reduce household clutter, you first have to decide where each thing belongs. It’s that last bit that trips up most people. They look around their home and see so many things out-of-place that they can’t possibly imagine doing anything about it. But the solution to dealing with household clutter is much like that adage about how to eat an elephant: you do it one bite at a time. Rather than look over an entire room (i.e., the elephant), focus on one small area. What’s bothering you the most? What will give you the most significant sense of accomplishment with the very least amount of effort? For me, that’s my kitchen island: a big thing where my family loves to dump everything when they walk in the door. As it happens, I need to use that kitchen island every time I cook a meal, so I am continually battling its clutter. 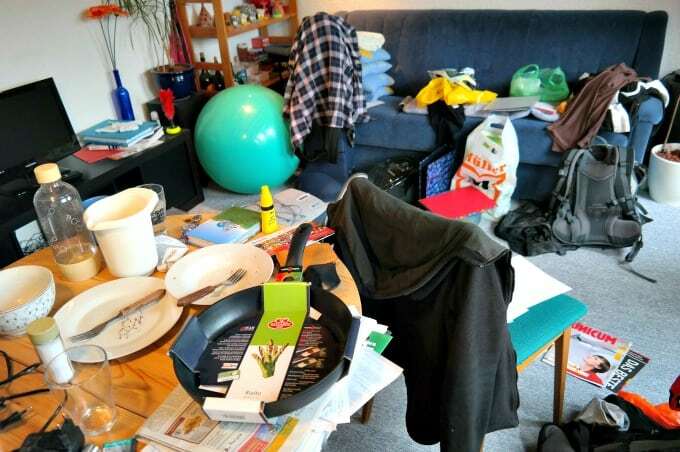 Once I’ve cleared it, I usually find myself moving on to other spots like the kitchen desk (where the things my family brought in should have gone in the first place), the coffee table, the stairs, etc. 1. Toss the trash. This is often the bulk of clutter on horizontal surfaces in the kitchen and family room. Get it out of the way and suddenly the elephant task doesn’t seem nearly as huge. 2. Put away things that belong nearby. Many times, the things on a surface belong in the same room, but someone was too lazy to actually put them away. On my kitchen island that usually means someone’s dirty dishes (which they never put in the dishwasher). Take care of what belongs in the same room where you’re working and your elephant… I mean, mess… will get smaller quickly. 3. Gather things that go to the same place. If several items go to another room (like the stack of comic books and sweatshirt my son left on the kitchen island this morning), take them there in one trip. This will keep you from running all over the house returning one item at a time. 4. If something doesn’t have a permanent place, maybe it doesn’t deserve one. By now, you’ll have a mostly clean surface. What’s still there? On my kitchen island, the remnants included some coupons I’d clipped a month or so ago and a brochure for an online course I’d thought about taking. We’ve gone to the store several times without using those coupons, and I don’t really want to spend my nights studying anymore. Once I acknowledged both facts, it was clear that stuff had no business staying on my counter. 5. If you absolutely must keep something, find it a permanent spot. Sometimes we get new stuff. Sometimes that stuff doesn’t have a dedicated place yet. That slick expandable folder where I’ve kept my husband’s medical bills does not belong on my counter, but I hadn’t found it a permanent spot yet. Rather than continuing to shuffle it from left to right, I took the two minutes to tuck it into the cupboard over my kitchen desk. Now it’s no longer household clutter but still easily accessible. If you have time to update your Facebook and Twitter status, you have time to do something about clutter. If you aren’t using that time to do something about the disorder, then you don’t really want to. What you want to do is whine about your household clutter. It may sound snarky, but that’s the truth — I’ve had to deliver it to myself more than once. Set a timer in the morning, and again at night. Use the time you’re waiting for the coffee pot to brew, the oven to preheat, the school bus to arrive, etc. There are plenty of chores you can do in one minute. The real key is just to do something, and then once you’ve purged clutter from one room move on to the next. Keep at it, and eventually, you’ll have conquered that elephant… I mean, your house. Need more structure? Then get my book, 30 Days to a Clean and Organized House, and find out why readers call it “life-changing” and “motivating.” You really can stop household clutter if you approach it with the right plan! Started clearing out the clutter for a move but when you have a removal lorry arriving the next day it all goes into a large box and it’s going to be sorted when we get to the new house. That’s the theory anyway. The lorry is arriving tomorrow and I’m in panic mode. I hope the move is going well, Jan! In our house the only solution would be to remove all horizontal surfaces. Yep, ALL. Replace them with something that slopes at an angle that’s just enough for stuff to slide off into the giant garbage bin you can install below due to no longer having any floors. Maybe then the caps off beer bottles opened less than 1m from the recycling will make it there instead of into the drawer with the bottle opener… because the drawer will be necessity have a sloping bottom and the bottle opener will also be in the recycling! Nice tips here. My ways are actually simple. Though I may sound busy in my life, I always put in mind that if you don’t know how to keep your small clutter it will eventually become a huge pile of mess. So I always make sure that no matter how little the clutter is, I take time to clean it. I need to start your take 10 minutes a day to declutter routine. It would really help! These are great tips. I like your “about” page, too. I’ve added you to my Bloglovin’ feed.